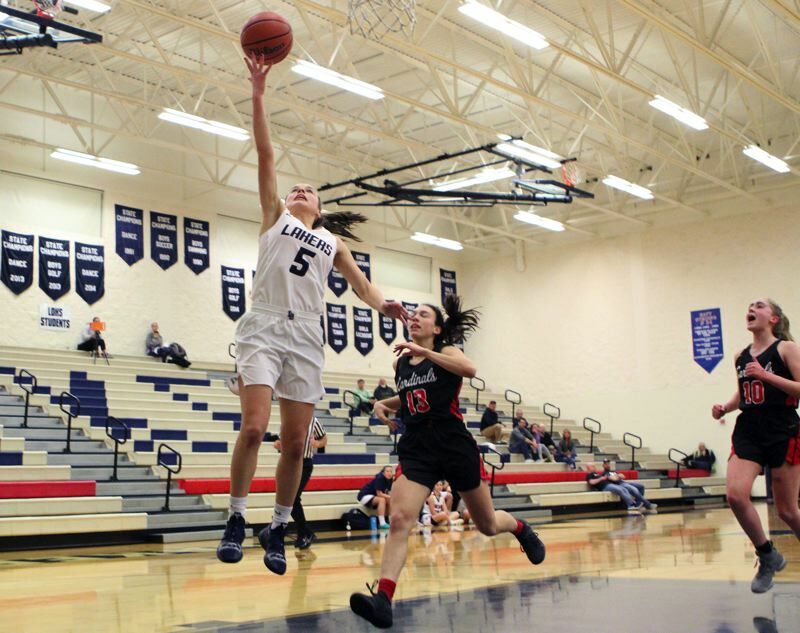 The Lake Oswego girls basketball team hit Lincoln hard at the start of its Tuesday contest at Lake Oswego High School. And when the Cardinals battled back into contention in the second quarter, the Lakers knocked them down again. Lincoln was still within three points early in the second half, but when Lake Oswego connected with its next haymaker, the Cardinals could not answer the bell and the Lakers pulled away to win 47-34. "Our 2-2-1 press, that was something we worked on this week," said Lake Oswego senior guard Taylor Anders, who led her team with 12 points on 4 of 12 shooting from the floor (including one 3-pointer) and a 3 of 8 day at the foul line. "Having Katy (Gilbert) and one of our other athletic guards in the front is really what causes the turnovers so the second line can get it." "I think that we've gotten a lot better at pressing teams after we worked on it a lot in practice and that's what helped us defensively," said sophomore guard Janie Ruttert, who hit five of her final nine shots (including one 3-pointer) to finish with 11 points. "Also, it was just us talking and matching up." With the win — the Lakers' second straight — Lake Oswego improved to 2-1 for the season. The Cardinals, who committed 31 turnovers on Tuesday, lost for the third straight time and fell to 1-3. Key to the Lakers' win, Gilbert said, was slowing down on offense and converting on their offensive chances. "We were pretty frantic in the first half and we talked at halftime about slowing it down and getting different looks in the offense as opposed to (taking) the first shot, because in the first half, the average shot was after about four seconds," said Gilbert, who finished with eight points, five steals and four assists. "That was definitely a focus in the second half." Anders helped her team get off to a quick start by scoring five points in the game's first 35 seconds, sophomore guard Emma Jeanson added a jumpshot from the right baseline and Anders hit one foul shot for an 8-0 lead with 2:41 left in the first quarter. The Cardinals finally got on the scoreboard when Corinna Bielen took a pass from Charlotte Anderson and buried a 3-pointer with 1:11 in the period, but the Lakers answered immediately with a "3" by freshman Kate Anders and led 11-3 at the end of the quarter. Lincoln — after turning the ball over 10 times in the opening quarter — settled itself in the second period, got to the foul line and stitched together a 7-2 run that cut the Laker lead to just 13-10. Isabel Homsi hit 3 of 4 free throws in that stretch, Anderson hit two more and Bridget Winthrop made a jumpshot from the baseline to bring her team within three points with 2:27 to go in the half. Undeterred, the Lakers closed the half on a 6-2 run that included a Gilbert steal and breakaway, a Kate Anders pullup and a Ruttert jumpshot for a 19-12 lead at halftime. The Cardinals weren't quite done, however. They started the second half with a drive from Alexis Heald and four points from Anderson to close within 21-18 — but from there, the Lakers finally put them away. Lake Oswego did just that by piecing together a 14-2 run that extended its lead to 35-20 late in the third and erased all Lincoln hopes of a comeback. Ruttert hit twice in that stretch and scored five points, Gilbert scored twice from the field, Taylor Anders added three points and Kate Anders a putback to put the game on ice. Lincoln got no closer than eight points the rest of the way. After the game, the Lakers acknowledged that their improved shooting in the second half set the table for their victory. "We all pretty much know our hot spots for shooting and we've gotten to know each other a lot better so we know where people like the ball," Ruttert said. "When we watch film, we watch their defense to try and find areas where they kind of leave gaps and so the weak side was really open tonight and that was a focus for us," Gilbert said. For the game, Anderson led all scorers with 14 points and Bielen added another eight for Lincoln. Kate Anders added seven for Lake Oswego. In upcoming games, the Lakers play in the Mats Tip Off Classic at Miramonte High School in Orinda, California, from Wednesday through Friday.